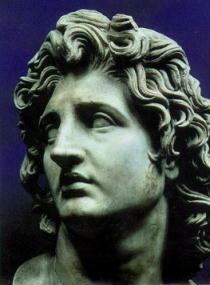 Home » Who was Alexander of Macedon? When Alexander, the oldest son of Philip, King of Macedon, was born in 356 BC, the greatest empire in the world was the Persian Empire. What was the Persian Empire? The great Persian conqueror Cyrus had conquered lots of smaller countries to put together the Persian Empire more than a hundred years earlier. Macedon was a small kingdom on the edge of the Persian Empire. Alexander’s father Philip was a strong and ambitious king. He wanted more power than just his own little kingdom of Macedon. Philip spent most of his life conquering the cities of Greece, to his south. He built a great army, that used new weapons and new ways of fighting and won its battles. Philip wanted his son Alexander to be an important, educated man. So King Philip hired the great Greek philosopher, Aristotle, to come teach his teenaged son Alexander and his friends. Alexander went to school for a while. He read the Iliad and the Odyssey, and books about the Persian king Cyrus. He read Herodotus and Thucydides, and probably Plato. But he was also learning how to fight. Alexander was a very good soldier and commander even when he was very young. By the time Alexander was eighteen years old, he led the left wing of his father’s army to victory at Chaeronea, the last big battle to conquer Greece. Two years later, when Alexander was twenty years old, a guardsman killed his father, Philip, and Alexander became king of Macedon and Greece. 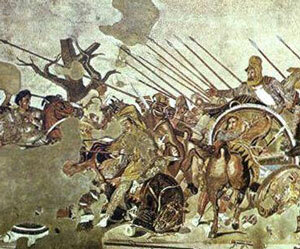 Soon Alexander decided to be like his heroes Cyrus and Achilles and conquer the Persian Empire for himself. In 335 BC, Alexander crossed over the Hellespont into the Persian Empire, marching his army south along the Mediterranean coast towards Egypt, conquering all the cities along his way (most cities actually just surrendered when they saw him coming). What was going on in Egypt? After Alexander conquered Egypt, he finally met and defeated the Persian king Darius III in battle at the battle of Issus in 333 BC. Darius ran away, and Alexander continued on through Mesopotamia (modern Iraq) into Persia itself (modern Iran). Cite this page: Carr, K.E. Who was Alexander of Macedon?. Quatr.us Study Guides, July 7, 2017. Web. April 23, 2019. No thanks! But thanks for the lovly website! Work hard play hard! I”m sure you aced your test because of your own hard work! But I’m glad I could help! If you have a teacher or librarian who would like to link to this site, we’d be very grateful, so other students could find it! Or, if you or your folks would like to sponsor our Patreon, it’s here: https://www.patreon.com/quatr_us. Every sponsored $1.00 gets the ads off an article so we can all enjoy reading without the distracting ads. Thanks, Kimora! We really appreciate you letting us know! Tell your teacher, and maybe they’ll link to us – that would help more people find us! I’m sorry to hear that, and I hope soon you’ll have teachers who inspire you more. Sorry, I don’t see a quiz with this article?